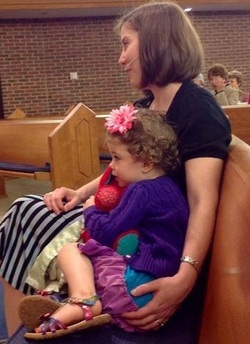 I took your curly-headed, rainbow-glitter-sandaled, stuffed-animal-toting self to worship on Sunday. We sat in the first pew, right behind the chairs that technically count as the first row. You come to church almost every Sunday, but you very rarely come to worship. Your Mommy and Daddy are both pastors, and I guess we’ve just been too busy. We thought we couldn’t be there to sit with you and sing with you and pray with you and answer your questions, so you stayed in the nursery with your little brother and the two best caregivers this side of heaven, but that’s going to change. You know a lot of important things about church: you know that it’s fun and has lots of friends – some younger than you and some older, some much older; you know that you are loved by all your church friends; you know it’s a place to learn because it’s your preschool, but you also know it’s a place to learn about God; you know it has a great playground, beautiful flowers, and a wonderful garden full of food; you know that it is safe; you know all about our Gathering worship service and you love to eat and play and dance to the music; you know that it’s your church, but it’s also my church and other people’s church and God’s church, so we call it our church. But you don’t know a lot about our traditional worship, because you aren’t there. I’m going to change that. ← Are young people curious about Christianity?